Amazing Mod Aline Shift Dress with 3/4 Sleeve Jacket! AMAZING!!! 1960s Vintage mod A line shift dress with jacket in super bright orange with square sliver buttons. The liner in the jacket is a very cool orange and blue square modern pattern. The jacket has 3/4 sleeves and accent pockets. The dress has accent buttons and HIDDEN pockets, so cute. Super amazing find! Very unique bright color. It is so bright it photographs odd. It looks more red in the pictures than in person. Picture a darker traffic cone orange. It is a thick fabric, with lined dress and jacket. Made very well, great construction. Definitely a higher end garment from the 60s. In wonderful condition. 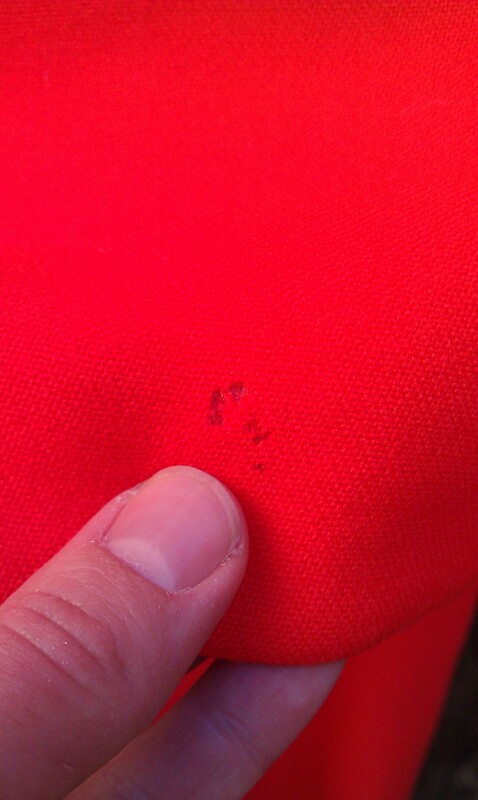 There is some small damage to the jacket. On the back there are a few pin prick size holes( probably price tags punch holes). There are a couple on the collar, one near the center of the back and on the bottom near the hem is some larger holes( shown in pics) I can send you more in depth photos on the defects. Dimensions: Size 8, but fits smaller, closer to a 6 on the jacket. Comments Off on Amazing Mod Aline Shift Dress with 3/4 Sleeve Jacket!